I’m always looking for an easy or simple side dish to make for my husband. Poor man doesn’t get much for banchan these days! Once in a while I have a sudden brain wave and realized that I can make Gaeran Mari/계란말이 (Egg roll!). This is quite like a an omelette, rolled up and sliced to show a colourful cross section. This recipe is so very easy, it always makes me wonder why I don’t make it more often. Mix the eggs and vegetables with a whisk until they are mixed well. Spray/grease a frying pan, lightly and pour egg onto the pan, just like you would an omlette. Keep the burner on low heat, and cook slowly for a few minutes until the “omelette” is almost cooked through. 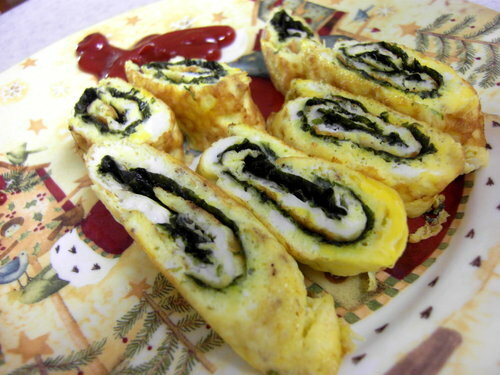 Place the sheet of seaweed paper on top of the egg mixture. Using a spoon or a spatula, lift one end of the omelette and roll it tightly (the same way you would roll up a piece of paper). Let the roll sit for a couple of minutes until it cools down. Slice into pieces about 1 inch thick and serve with the pretty centres showing. Voila! (Serves 1 as a snack and 3 as a side dish). Here is how mine turned out! I didn’t have carrots here, and I took out the onions. Honestly you can play around with this recipe and add anything you like. Maybe zucchini, mushrooms, cheese! Usually I would add cheese.